Windows 8 comes with some brand new features which were never seen before. 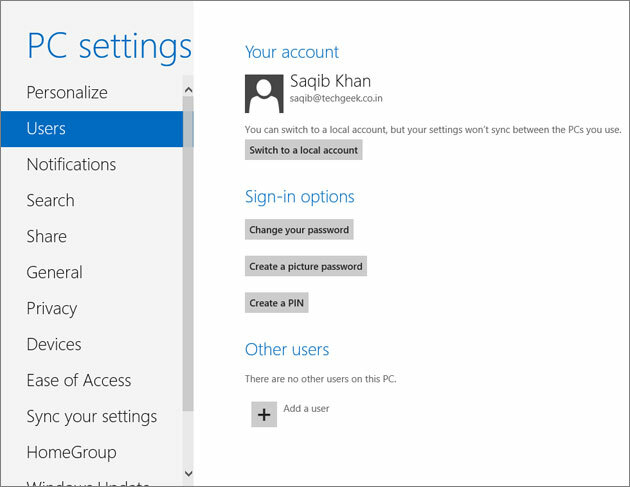 Windows 8 comes with two different type of user accounts and options to log in. You can either create a local account or choose to sign in with Microsoft account (formerly known as Windows Live account). 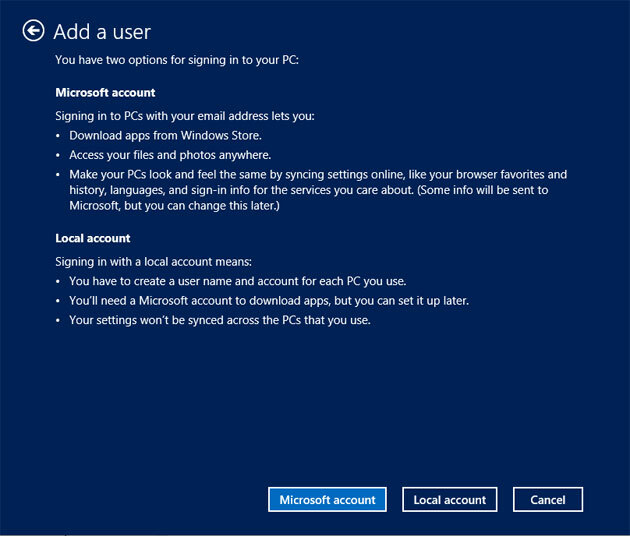 The local account option is what we have normally seen in Windows till yet but the option to sign-in with Windows account is what comes new in Windows 8. If you want to sign with Microsoft account (email address), then it means that your settings, browser favorites, history, internet settings, languages, data, certain apps, etc. can be synced online with other Windows 8 PCs and tablets. Basically this means that you are connecting your PC to the cloud. If you have already created online account using your Microsoft account login credentials, then you can start configuring sync settings on the PC. But if you want to convert your Microsoft account to local account, then this is possible and doing it vice-versa is also possible. 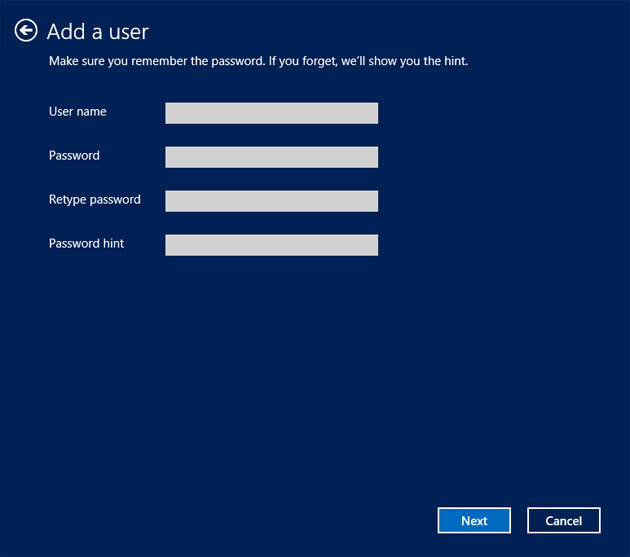 Let’s learn how to create a new user with Microsoft account or Local account and configure PC Sync settings in Windows 8. Firstly, lets learn how to create a new local user account. Open Charms bar by using the shortcut key – Windows + C and then click on Settings. Click on More PC Settings to open PC settings. Click on Users from the left sidebar and then click on Add a user. The “add a user” window will open. Since we want to create a local account, there is no need to enter email address. 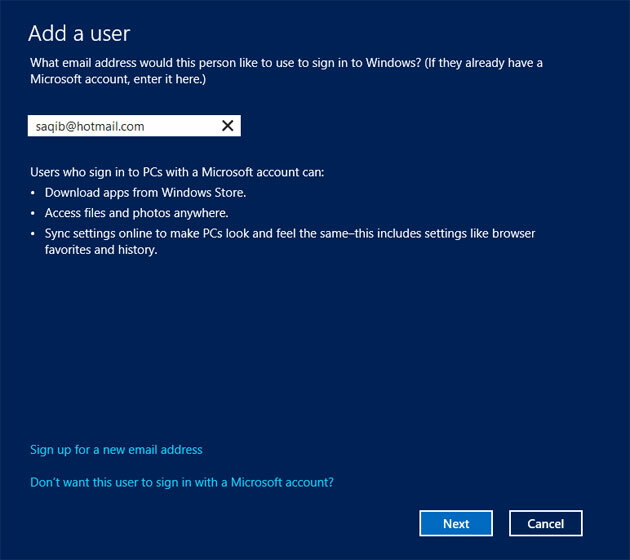 Click on Don’t want this user to sign-in with a Microsoft account? from the bottom of the screen. In the next screen, you can see detailed explanation and difference between signing in to PC with online Microsoft account and local account. This should help you get a clear idea of which account to create. Note that local account is limited to your PC only and you won’t be able to sync your Windows 8 settings, passwords, history, favorites and more to other PCs and tablets running Windows 8. To proceed creating Local account, click on Local account. Enter user name, password and password hint. Click on Next. That’s it. With this step completed, you have successfully created a local account on Windows 8 PC. As you may have guessed, to create a Microsoft account, you need active internet connection. Those who don’t have internet connection will need to sign-in with Local account. There are many advantages of creating and using a Microsoft Account. The main plus point is synchronizing of settings, data and credentials between different devices. Click on Add a user from PC settings window. In the next window, you will be prompted to enter an email address. Users will need to use this email address and the password of this email address to sign-in to the PC, every time. If you have opted to use Microsoft Account, then you can sync settings and data with the cloud. 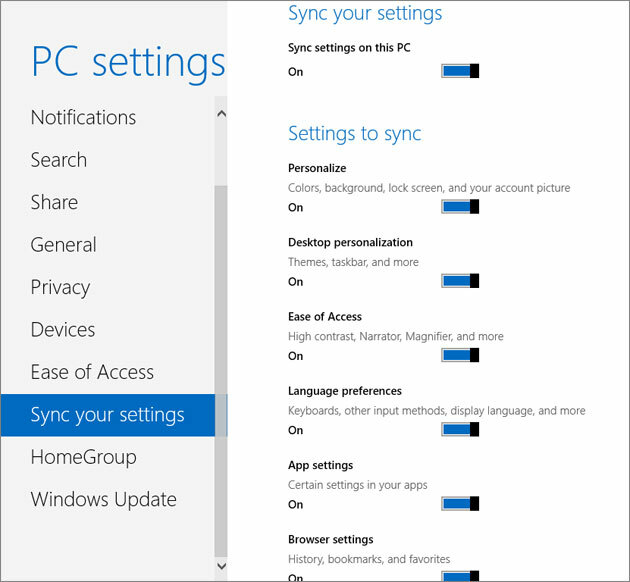 To configure the Sync settings, go to PC Settings and there you can see a new option named as Sync your settings. Click on this option to view different sync settings. The first option helps you to enable or disable sync on the current PC. Other options allow you to configure whether you want to sync various settings like colors, account picture, lock screen, background, themes, taskbar, language, narrator, magnifier, app settings, browser settings and many more. The app settings option is very useful as this option can sync certain settings in your apps. Signing in using Microsoft account has got many advantages as it syncs your data and settings to the cloud. Even if you are not thinking to use Windows 8 on more than one device, it makes sense to sign-in with Microsoft account so that in case of data loss or computer failure, you can easily recover your settings that were synced online. Your data will always remain safe in the cloud. But if you are using Local account to sign-in, then unfortunately there is no such option to recover your settings. Therefore choose wisely from both of these different type of user accounts. Note: To switch from Microsoft Account to Local account, go to PC Settings and click on Users. From here, click on Switch to a local account.